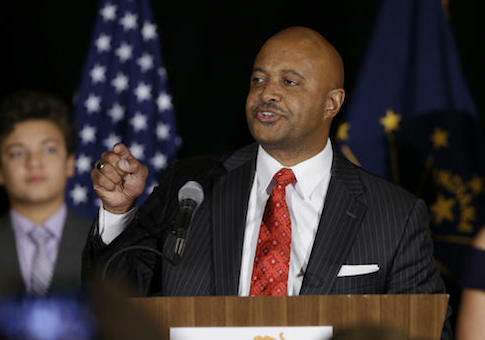 Republican state officials battling federal overreach recently gained another ally through Indiana’s election of incoming Attorney General Curtis Hill. Hill, who defeated Democrat Lorenzo Arredondo with nearly 62 percent of the vote, will become the state’s first black attorney general. The former prosecutor set a record on Nov. 8 after receiving the most votes of any candidate in Indiana history, beating out President-elect Donald Trump by nearly 100,000 votes. Hill in part attributes the overwhelming support to his pledge to rein in federal overreach and regulation, particularly in a year when Americans’ distrust of officials in Washington has spiked. "When I traveled through the state of Indiana there were a significant number of people who were concerned about the role of the federal government in our every day lives," Hill told the Washington Free Beacon in a phone interview. "They wanted to make sure that there was someone in state government, particularly in the attorney general’s office, that recognized the value of people within states making decisions on what goes on in that state." The 55-year-old grew up in Elkhart, Ind., 15 miles east of South Bend. He graduated from the Indiana University School of Business and later received his law degree from the Indiana University School of Law. Hill returned to Elkhart to begin his legal career as a part-time deputy prosecuting attorney before serving as the county’s elected deputy prosecuting attorney for 14 years. Hill, a father of five, built a reputation in Elkhart as a hardline prosecutor who fought against illicit drug use and violent crime. He plans to bring that focus into his role as attorney general, while taking on federal overreach. While he expects the incoming Trump administration will rein in the scope of its executive agencies, he predicted regulatory burdens would persist. "The reality is that the bureaucracy in Washington, D.C., far exceeds the incoming administration’s ability to catch up in many instances," he said. "From my standpoint, it doesn’t matter who’s in the White House: federal overreach is federal overreach." Hill said he wouldn’t shy away from pursuing legal action against the Trump administration if his office determines federal officials have overstepped their constitutional authorities and implemented a rule that harms Indiana residents. Each action will be evaluated on a "case-by-case" basis, he said. Hill’s election adds momentum to a drive by Republican state attorneys general who began an aggressive fight against federal overreach during the Obama years. Oklahoma Attorney General Scott Pruitt, who was elected to the post in 2010, told the Free Beacon that he anticipates Hill will provide leadership, "intellectual capital, and a sense of strategy to effectively respond to some of the federal overreach that we see." South Carolina Attorney General Alan Wilson also has high hopes for Hill. "I’m looking for attorneys general who want to promote the free market over excessive government regulation, who are looking at the constitution through the eyes of an originalist rather than trying to change and write the rules as they go, and who are going to stand up to the rule of law," Wilson said. "Of everything I’ve heard from Curtis [Hill], that’s exactly what he’ll be—somebody who’s going to call balls and strikes on the rule of law and nothing else." This entry was posted in Politics and tagged Curtis Hill. Bookmark the permalink.